This is a bit of a strange, stream of consciousness post (same as most of them I suppose) so it may go a bit off-topic. Though perishingly cold this morning I took my hands out of my gloves for long enough to take a couple of photos. One of them is an example of how man-power in China means that things really do get done quickly and effectively. When I was in India at Christmas it seemed that because of the vast population, people were given beurocratic jobs so that unemployment was kept low. I learnt this from chatting to several of the locals at the conference. This slowed things down vastly and made getting jobs done take twice as long as necessary. It's probably extremely naive to compare the two countries based only on their vast population because the history and culture of each has evolved on very different paths. It is my initial impression however that China is genuinly learning to use its man power to get things done very quickly. There is of course a lot of beurocratic nonsense but I understand that this is also improving fast. 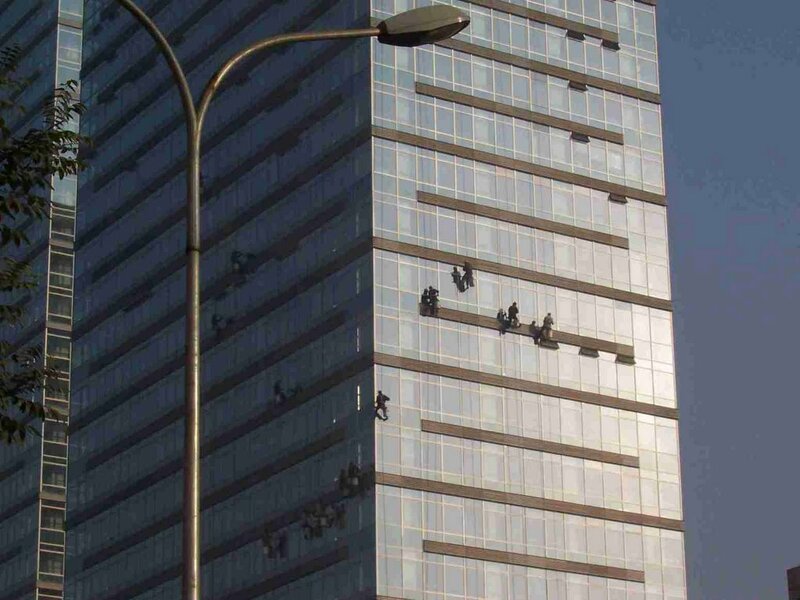 Because of the pollution here the buildings are cleaned regularly so it takes these guys just a few hours to do a whole skyscraper. The other photo is of the main conference building on the CAS site. I'm still not sure whether or not I like it but it is impressive on a clear day. This next photo I took a few days ago and is an example of something I've seen a lot recently. I'd been told that Beijing and China in general were moving fast, the people were changing and the city was growing. Some things though are rather strange to Western eyes. Generally the style of clothing worn by young people is colourful but still quite uniform. Not long ago, most people were still wearing Mao jackets and you still see some people wearing them now. There's a reasonably big shop on the campus catering for the thousands of people here. I tried to buy a bedside lamp amongst other things but it's impossible to get something simple and stylish. I guess that's the point I'm trying to make. Partly because of the lack of wealth and partly because the idea is relatively new to the Chinese, style still has some way to go for the average Feng or Ling on the street. 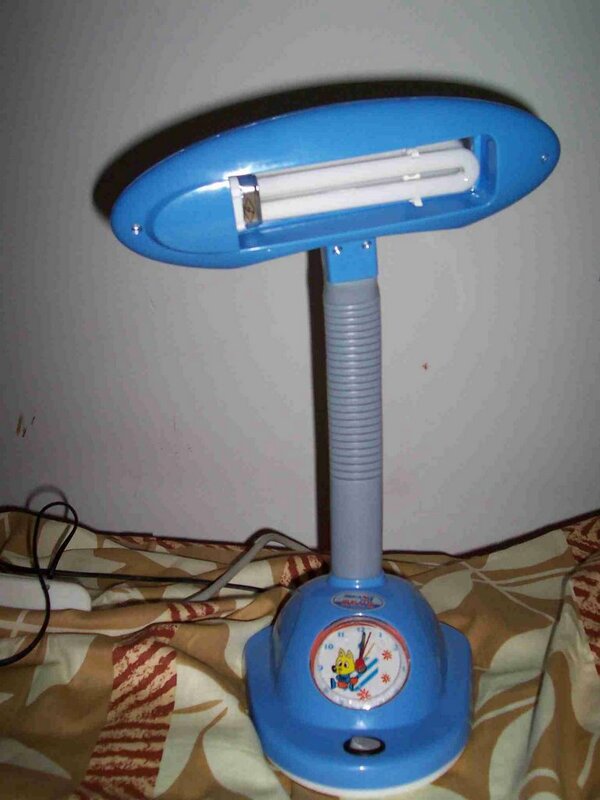 The following was genuinly the most adult, stylish lamp I could get. This was from a choice of ten or so. This is just a small example of one of the minor differences between the two cultures at the moment. This isn't to say that there aren't some very well dressed Chinese and there are some very affluent areas where the rich kids hang out, I just haven't been there yet. I think I'm getting a reasonable impression of what life is like for the average Chinese academic who is paid a high enough salary to live on but not to get the luxuries in life. 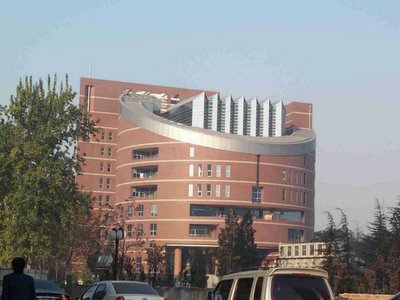 Another lecture in Chinese today, this time about a duality relation between Planck scale physics in non-commutative spacetime and DeSitter vacua. I am I'm afraid none the wiser after the hour seminar but it did give me a little practice of projective geometry which I haven't thought about for a while. I guess I may as well talk about projective space briefly here while I'm on the topic. The subject of topology is explained using the language of set theory which I won't explain now. For the non-mathematician, topology can be thought of as the study of flexible sheets and shapes. Two sheets which can be stretched into one another are said to be topologically equivalent. For instance a rugby ball and a football are equivalent (given enough pushing and pulling). A football and a rubber ring however are not becuase one has a hole in which can't be stretched away without tearing it. Here's a nice example from the university of Winnipeg. Each line shows different shapes which are topologically equivalent while each column gives a topologically different shape. Anyway, in four-dimensions there are an infinite number of topologically different 'manifolds' (read surfaces for now) with any number of holes in. It turns out that there are some topologies of two-dimensional surfaces which cannot live in three-dimensional space. You need another dimension in which to cut and sew your piece of paper/rubber sheet. These are generally non-orientable manifolds. An example of one which can be embedded in three-dimensional space is the Mobius strip. 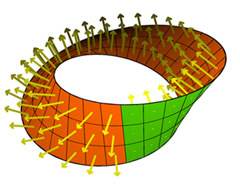 It's impossible to define a unique, continuous vector field pointing out of the Mobius strip. You always end up pointing in the opposite direction to the direction you started (again this isn't a mathemetically rigorous or indeed quite correct statement but it'll do for now). Anyway, if you were to try and link up the edges of the Mobius strip in three dimensional space you'd have some problems doing it without it intersecting itself. This is the same problem as trying to tie knots in two-dimensional space. Without going into the third dimension to let the string cross, you're in trouble. So the reason I started talking about this is because there are some interesting shapes that come out of studying non-orientable surfaces and one of these is the projective plane. Take a football (a flexible one where you can stretch and bend the surface with ease) and take two opposite points on the surface and bring them together. Now try and do the same with all the other points on the surface. You won't be able to do this in three-dimensional space but you could if we lived in one dimension higher. Here's an illustration of the projection of this image into 3d (onto 2d!). 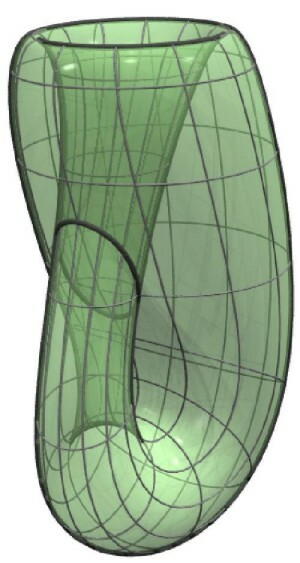 The other simplest non-orientable manifold is the Klein bottle (of which there are some great glass models in the science museum in london). The point is that you can try and make these shapes in three-dimensions but they will always have to intersect through some line. If you were in four-dimensions they wouldn't have to intersect themselves. Again that all seemed to spill out without my control so apologies for filling it with maths talk but hopefully the pictures will make up for it. Di Francesco is one of the most wanted book ever, since here we have only one copy! All very interseting Jon. I like the pictures. I look forward to your next instalmant. Luca, though they look like and smell like genuine Di Francesco's, I have a strong suspicion they are actually copies. There are deals with some publishing firms which means that some books (Weinberg ,Polchinski etc.) are only $10 each. There is however a great market in carefully photocopied and bound fakes. While it would be a great money spinner to buy these and sell them to America, I believe there is a name for people who import pirate goods, and it's not good. I'm going to try and avoid the fakes as much as I can but was taken in by the quality of this one. If you make it to Strings '06 I can show you where to get the real ones. Nice lamp. That made me chuckle. I'm not brave enough to try the alarm just yet. Plus, even though the lamp plugs into the mains, the alarm is battery powered and batteries seem to last about five minutes here. I'll try and get a photo of the others some time.